Some large format films deliver a wide range of landscapes, visual subject matter, or span great distances around the globe. "Roar" focuses on a lone waterhole in the arid Kalahari, like a lioness on her prey. 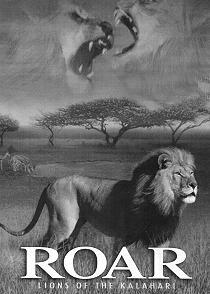 The film follows an old king and the two lionesses he watches over. But there is a young male in the brush looking for a duel, the winner of which gains the kingdom. This provides a strong story plot to an otherwise visually impressive wildlife documentary. Though much of the footage is shot on 35mm (instead of 70mm, which previously defined large format), you'll no doubt find the incredible live action imagery captured worth the drop in resolution. Grainier than the format standard with a slight drop off in color, still, who can argue with an amazing shot of a lioness literally snatching a hopping spring buck out of the air. Absolutely stunning. Some wildlife productions seem to place their best shots strategically, filling in the in-betweens with lots of landscape. But, "Roar" is chockfull of strong wildlife shots: zebras, spring buck, all in abundance, even a few elephants to stir up the lions. There are very few "in-betweens." A few shots catch the lions prowling in the tall grass under a starry sky. Shot during the day, then manipulated in post... but still sweet. A somewhat abrupt ending (with some hokie text) tops off an otherwise very well-paced, visually and mentally stimulating, production. A word of caution: though the lion "kills" aren't gory, these are still wild animals and there may be some viewers who will find the attack scenes perhaps too violent. Personally, I found them fascinating and educational. Impressively filmed with good action, a compellingly dramatic (if a bit soapy) story line with simply great lion shots, "Roar" is worth the grain. I spoke with producer Jini Durr at the screening and asked how a photographer could get so close to the lions without becoming lion food. She said, "lions aren't very interested in eating people." She also said, "In the heat the lions even rested in the shade of the cameraman." Roar: Lions of the Kalahari. Copyright © 2004. Cinematogrphay by Tim Liversedge and Richard Jones. Produced by June Liversedge and Jini Durr at National Geographic.